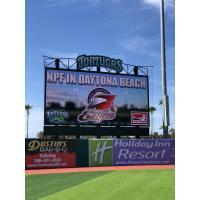 DAYTONA BEACH, Fla. - On the eve of the Daytona Tortugas' season opener, the team has reached an agreement with the Beijing Shougang Eagles of the National Pro Fastpitch (NPF) women's softball league to make Jackie Robinson Ballpark the team's home for the 2019 season. Comprised of predominantly Chinese-born players, the team has competed in the NPF each of the last two years as it attempts to qualify for the 2020 Summer Olympic Games in Tokyo, Japan. The Eagles will hold team practices and games against the five other NPF organizations throughout the summer, while the Tortugas are on the road during their own Florida State League schedule. The Chinese Softball Association was enticed to the partnership after a series of renovations were completed at Jackie Robinson Ballpark, including the brand-new turf field, which was installed during the offseason. "We are extremely excited to showcase Jackie Robinson Ballpark as one of the premier facilities in all of Central Florida," said Tortugas president Ryan Keur. "This is an incredible opportunity to welcome the best softball players in the world at our ballpark, while our team is on the road. In conversations with Yang Liu and the Chinese National Team over the past several months, the deciding factor was recent stadium upgrades at The Jack, as well as the atmosphere and rabid fanbase that we have here in support of the Daytona Tortugas." Owned by the Chinese Softball Association, the Beijing Shougang Eagles enter their third season in the NPF, but their first with a permanent home. The landmark deal between The Chinese Softball Association, NPF, and Daytona Beach will see the Tortugas handle all marketing, ticket sales and game-day production of the 25 home games scheduled for Jackie Robinson Ballpark. The NPF season runs from mid-May until early-August. The league champion is decided in a best-of-three series between the two squads with the best records. China will attempt to become one of the latest countries to qualify for the 2020 Summer Olympics, as softball and baseball return to the games for the first time since 2008. The United States and host country Japan have already qualified for the Summer Games. China will participate in the Asia/Oceania qualifying event which will be held between June and September 2019. The winner will guarantee themselves a spot in the upcoming Olympics. As a participant in last August's Women's Softball World Championship, China finished 4-3 in Group B and came in 10th place out of 16 countries that qualified for the event. In the 2008 Summer Olympic Games, the Chinese National Team posted a 2-5 record, which was tied for the fifth-best mark out of the eight countries that participated.